Vedantika Herbals Private Limited is a sister concern company of Ncl Agro Foods, an ISO 9001:2008 certified company was founded with the vision to provide high quality Herbal Products. 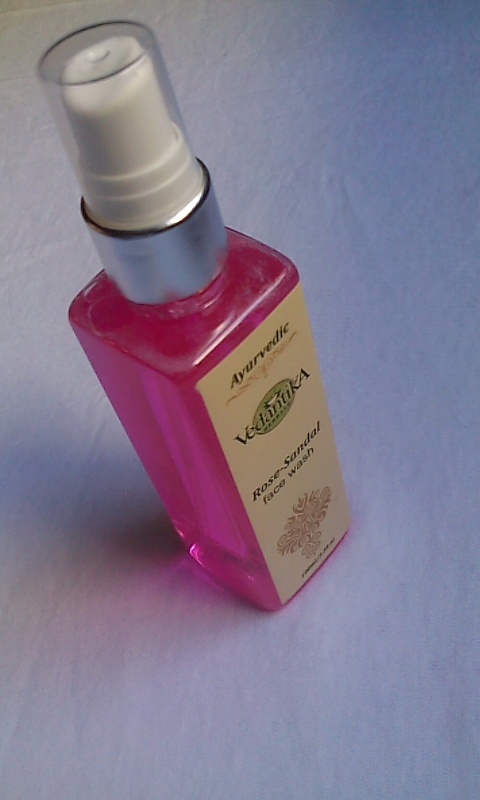 Vedantika Herbals combines the knowledge of ancient Indian Medicine with modern research and technology. 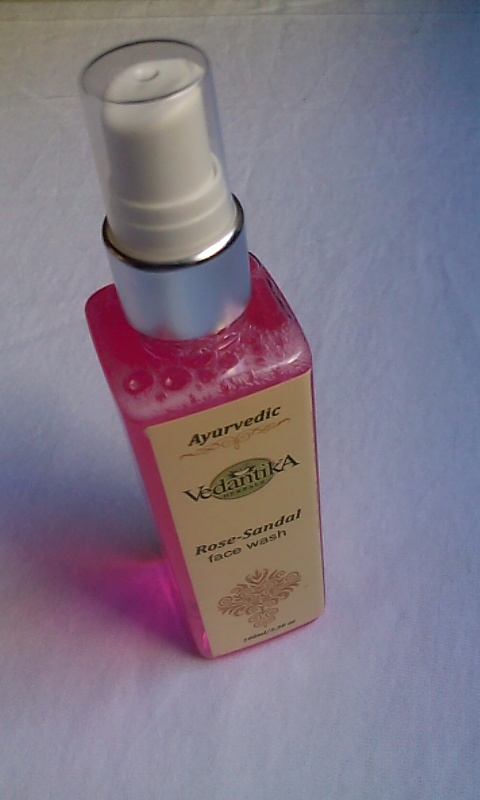 It is a constant endeavor of the company to cross all the barriers in bringing flawless products. 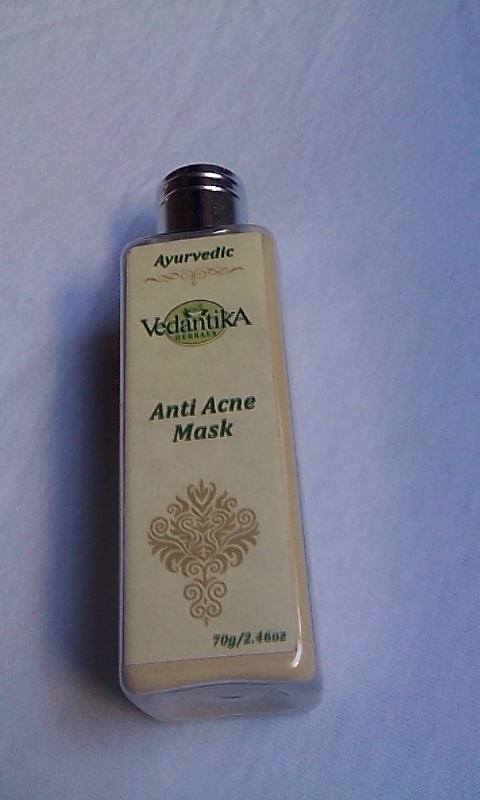 Vedantika Ayurvedic Anti Acne Mask is a rare combination of Herbs traditionally used to give radiant glow to the skin. It enhances cell regeneration, improving skin metabolism. 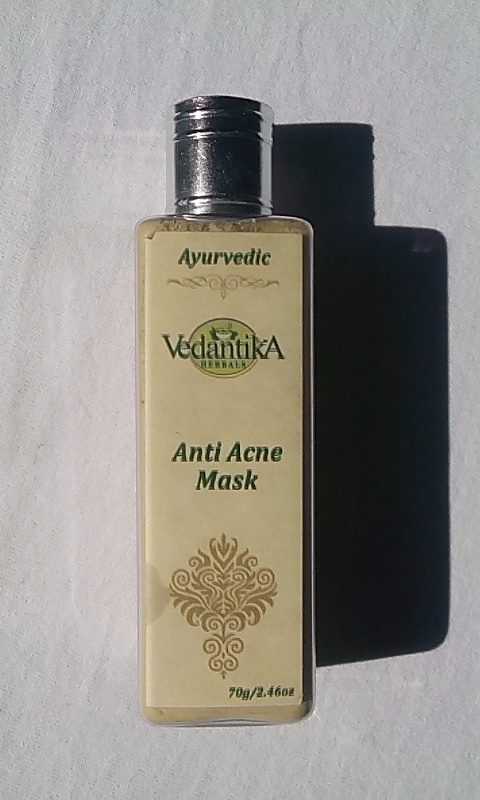 Leaves your face looking years younger. The face mask comes in a clear plastic bottle with a screw type aluminium lid. The packaging is simple and classic. 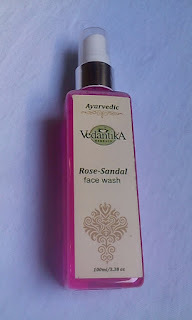 The face wash comes in a transparent plastic bottle with a spray nozzle which make it easy to eject drops of facewash. It comes with a plastic cap that shuts tightly. The packaging is so simple and travel friendly. 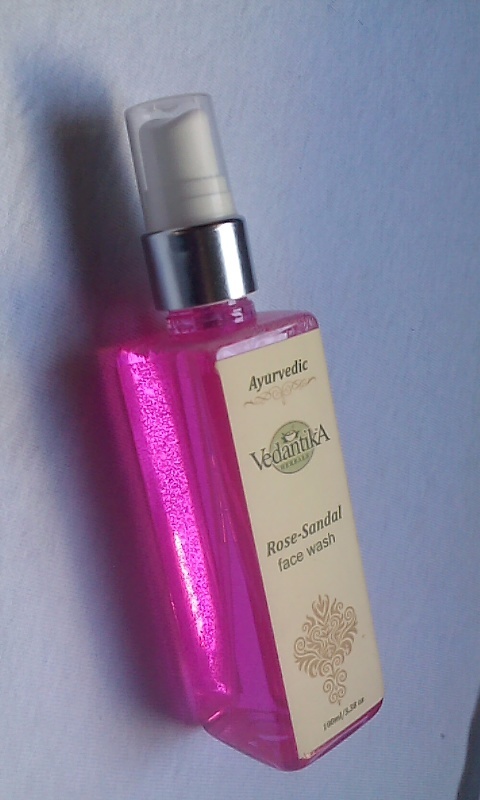 This face wash has a mild rose & sandalwood fragrance similar to pure rose water, I love the fragrance. My skin feels soft and supple. My skin does not feel dry or stretchy and in fact feels moisturized. 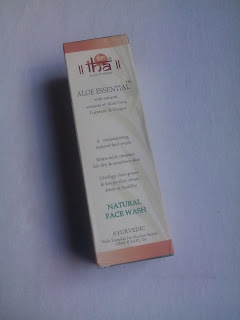 I highly recommend this face wash to everyone out there! 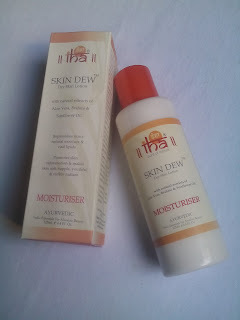 IHA line personal & beauty care product is extension of Authentic Ayurveda into personal & beauty care. 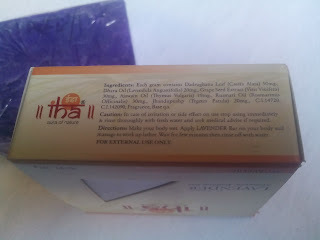 All the IHA products are strictly based on the basic principles of Ayurveda & Holistic Healing i.e. Panch Bhootas (5 Elements - Earth, Water, Fire, Air & Ether), Three Life Forces, Tridoshas (Three Imbalances - Vata. 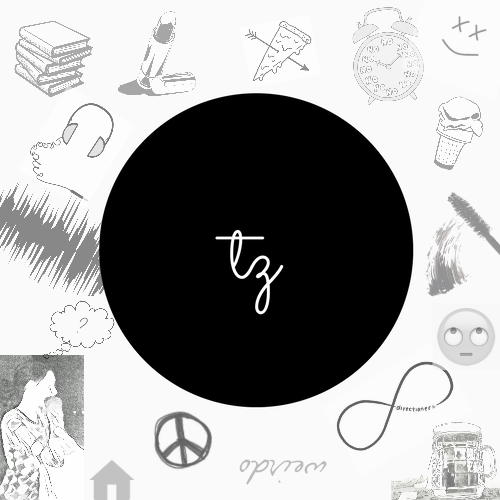 Pitta & Kapha), Tridosha correction Therapy & establishing a balance between Macrocos & Microcosm. 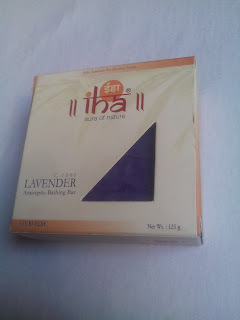 The IHA products are made with due respect to ayurvedic traditions & more focus is given on the use of traditional ayurvedic preparations to make authentic, effective, beauty treatments, utilizing time tested & proven ayurevedic herbs & the claims made for their therapeutic values can be tested on strict international parameters of modern time. 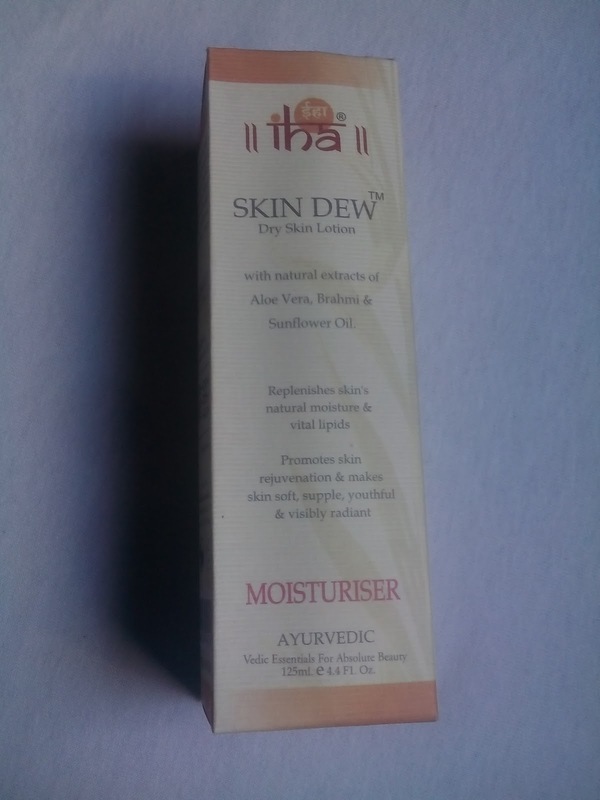 IHA skin dew is an ayurvedic dry skin lotion prepared from “claimed to be the best” natural/ayurvedic- skin moisturisers & emollients. Enriched with natural extracts of Aloe Vera, Brahmi, Cucumber, Almond Oil & Sunflower Oil, IHA SKIN DEW is a rich creamy lotion that quickly penetrates the epidermis and replenishes skin's natural moisture and vital lipids. The natural actives like Brahmi & Aloe Vera promote skin nourishment, cell renewal & skin rejuvenation, make skin soft, smooth, supple, youthful & visibly radiant on regular use. Available online at IHA website. 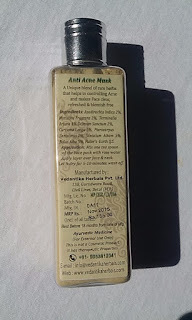 Apply this cream on your face, throat and other body parts showing the signs of dry skin condition. Gently massage in circle with fingertips till the cream gets absorbed into your skin. 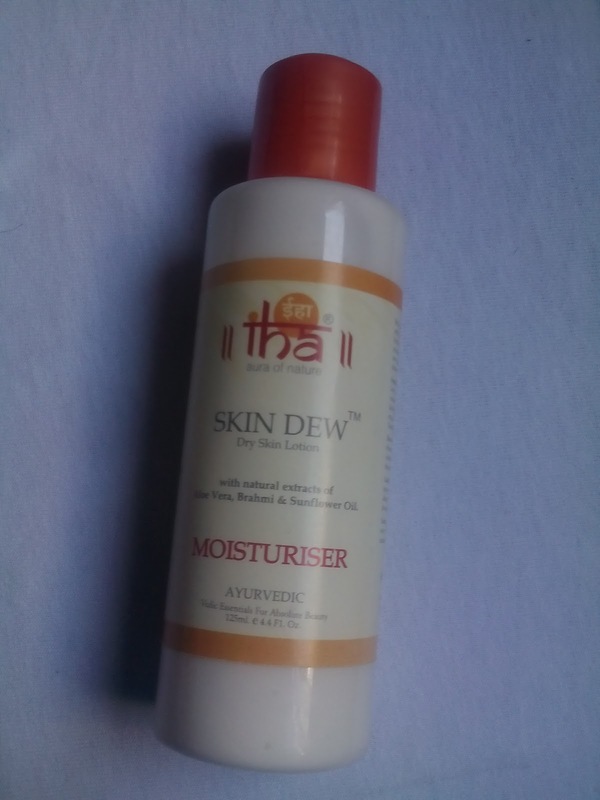 This is one of the best moisturiser i've ever used. And the best part of this moisturiser is that it doesn't contains harsh chemicals & don't have strong herbal fragrance. This product nourishes my skin so deeply & reveal glowing skin. I have noticed a considerable improvement in my skin. 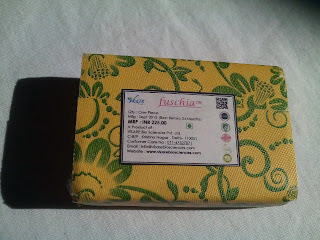 Fuschia Was Born Out Of Its Parent Company Vkare Bio Sciences In 2013. 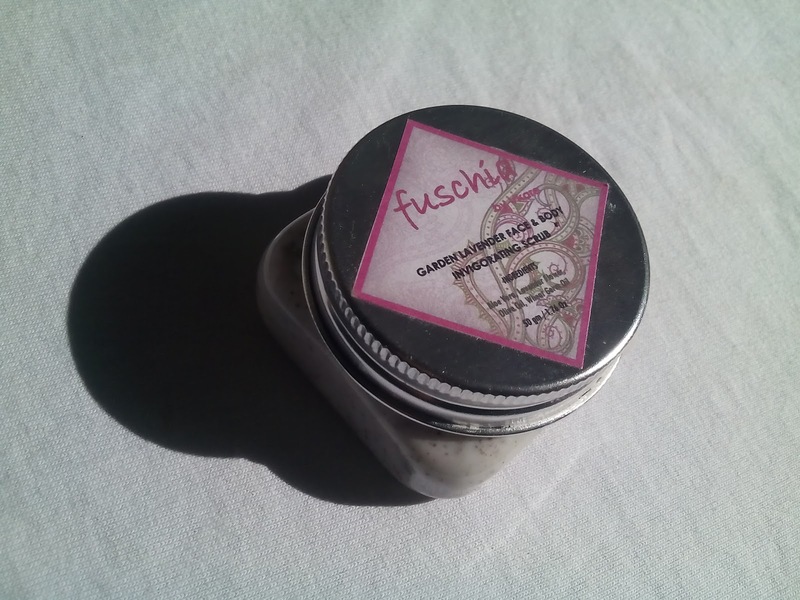 Since Its Inception, Fuschia Is Consistently Evolving And Has Established Itself As A Brand Dedicated To Natural , Handmade Skincare Products. From Natural Ingredients To Manufacturing Process , From Unique Packaging Styles To Eco-Friendly Policies, Fuschia Stands Apart From Most Of The Conventional Cosmetic Brands. 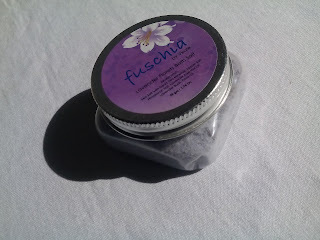 At Fuschia We Strive To Reach Out To All Those Who Want To Go All Natural And Eco-Friendly, With Our Range. Our Constant Efforts To Provide Our Customers The Best For Their Skin And At The Same Time Contributing Towards Saving Our Ecosystem Makes Our Products A Little Pricier But Still Affordable For Those Who Really Care. Garden Lavender benefits oily skin removing excess oil & helps dry skin by stimulating blood circulation & production of natural body oils. It also has a calming effect on your senses. 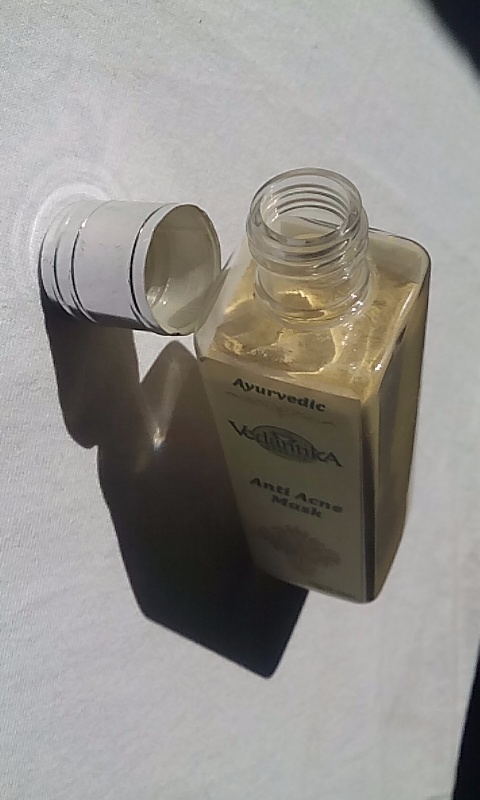 Aloe vera, olive oil & wheatgerm oil together moisturize & regenerate your skin. 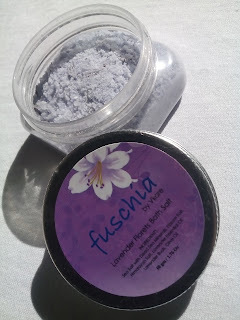 The pacakaging is similar as Fuschia Lavender Florets Bath Salt. 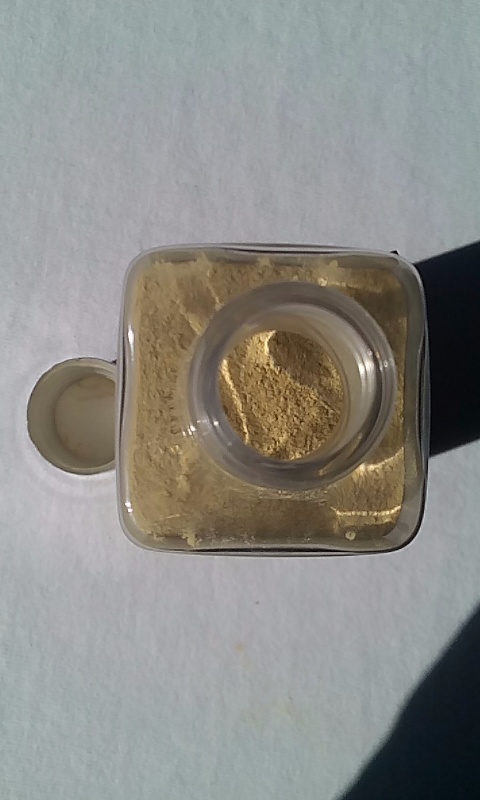 This scrub comes in a transparent plastic tub with a screw open lid. It is travel friendly, but only thing you need to dig your fingers to take this scrub for use, so do sanitize your hands before touching. Aloe Vera, Lavender Flower, Olive Oil, Wheat Germ OilEnriched with Lavender, this scrub acts as an astringent and controls acne breakouts. This scrub not only tones and soothes your skin but calms your senses. 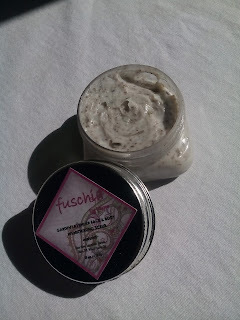 Apply the scrub to moist skin and rub it in a circular fashion. My skin feels soft, smooth and refreshed after every usage! This scrub really hydrated and exfoliated my skin. 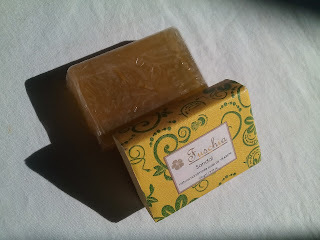 It does not moisturize skin however skin feels softer than usual after every shower. The scrub particles are very mild and not at all harsh. The aroma of this scrub lingers around for long time. 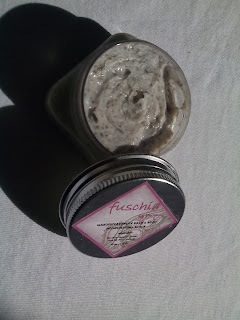 A small amount is enough for exfoliate your face and neck. 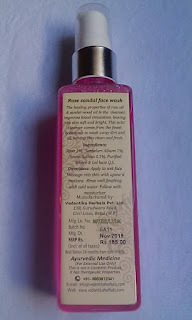 Free from paraben and SLS. Creamy texture and didn’t makes the skin dry. The soap comes in a transparent plastic sheet. And the outer covering is of bright yellow crafted paper. 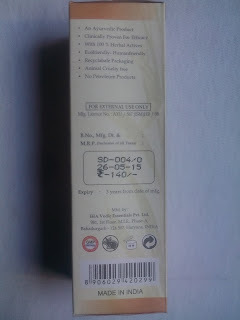 The soap is visible from both of the sides of packaging. The soap is semi transparent. Apply the soap on the body and massage to work up lather. Wait for few minutes and then rinse off. 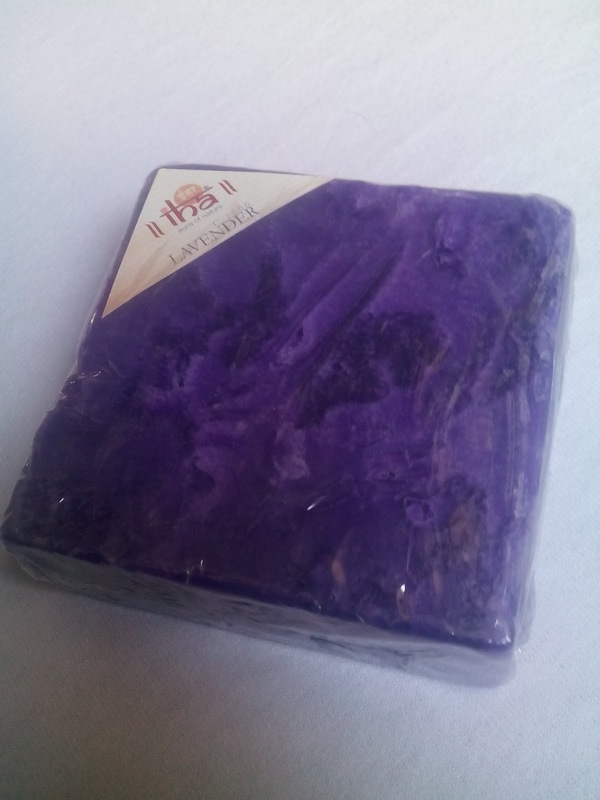 The soap has very light fragrance like sandalwood, it is quite decent and relaxing. 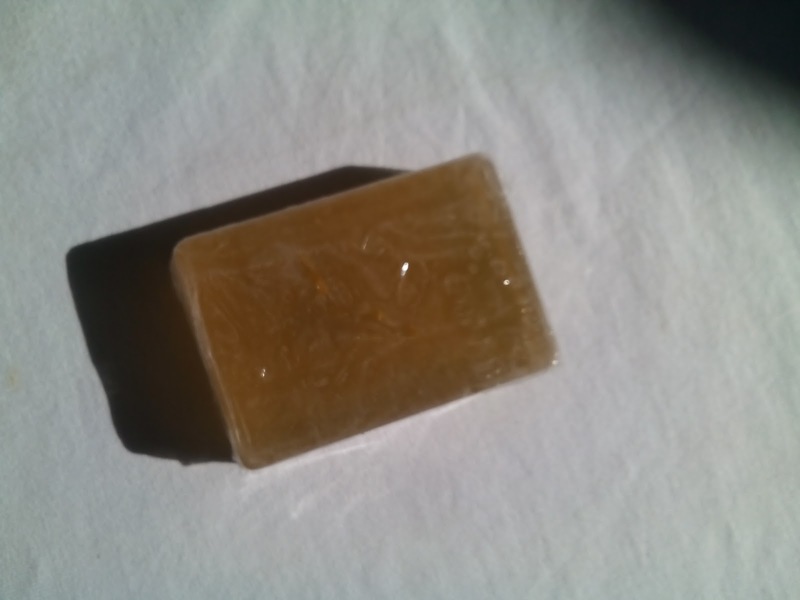 Even though it is glycerine based it makes my skin bit dry. The soap is not suitable for winters specially for dry skin. It lasts for 10-12 days. 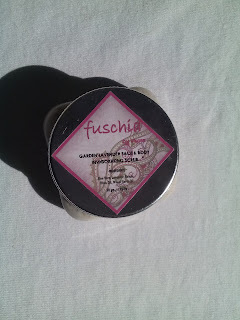 Overall these soaps are worth trying. It comes in transparent rectangular tub with a lid. 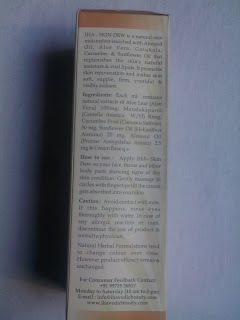 Along with a small paper note which contains ingredients list, product claims & direction to use. 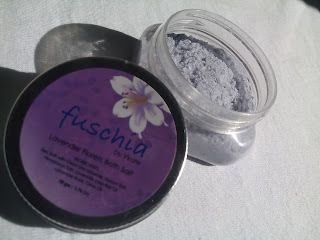 Sea Salt with Dead Sea Minerals, Epsom Salt, Himalayan Salt, Lavender Essential Oil, Olive Oil & Lavender BudsLavender Florets - Lavender Essential Oil with Flower Buds calms and relaxes ones mind and promotes a restful, uninterrupted night's sleep. 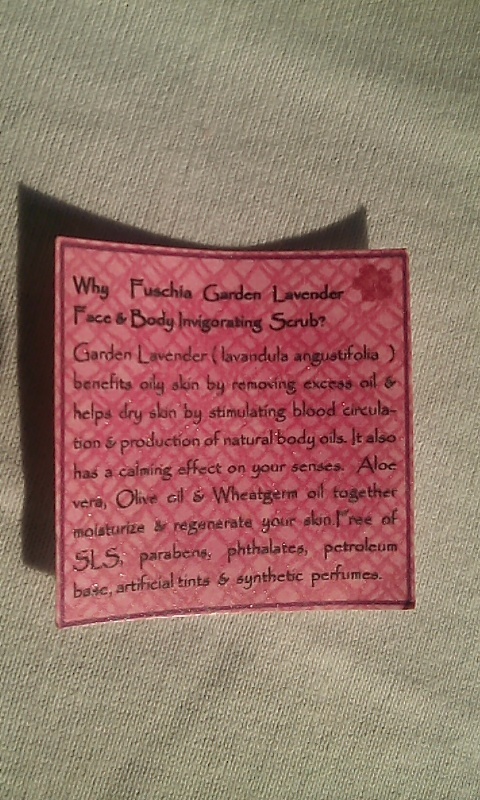 Scrub gently, for exfoliation. 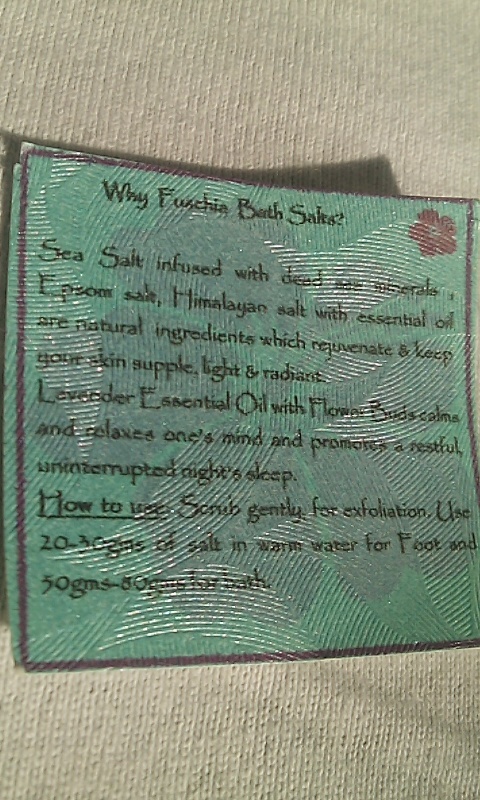 For foot use approximate 20-30gms of salt in warm water and for bath use 50gms-80gms bath salt in warm water. I was completely relaxed and refreshed after using this. I felt stressed out & calm after a hectic day. The fragrance is quite strong but i love it. 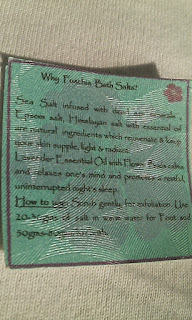 Overall I love this bath salt it made me feel like i had been to a spa. 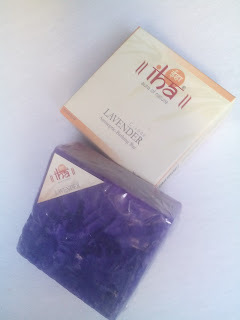 IHA Lavender Hand Made Soap is a natural and powerful, yet gentle with strong cleansing actions. 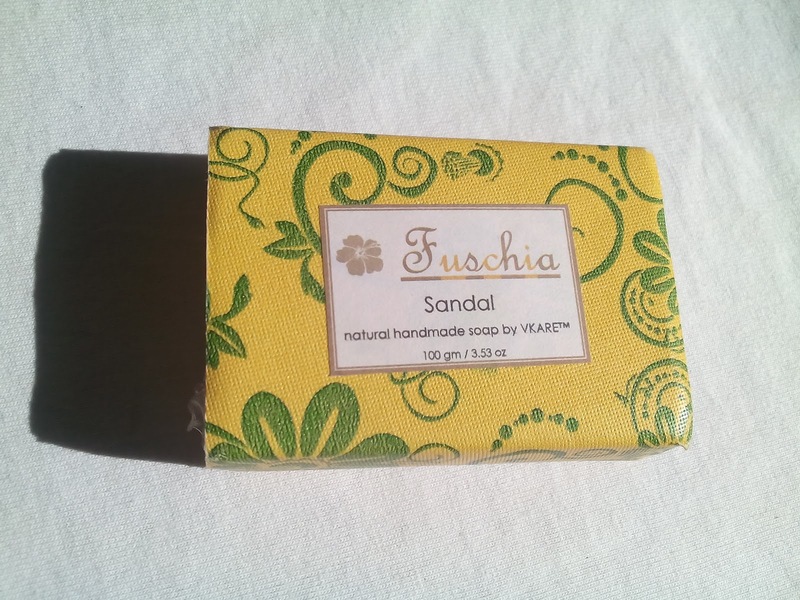 This bathing bar thoroughly cleanses, purifies and detoxifies your skin of all the germs and infectious materials. The antiseptic and cleansing properties of lavender, thyme and rosemary help to unclog skin pores and deeply cleanse the skin on a cellular level, leaving you feeling fresh and scrupulously clean with a revitalizing aroma of lavender that exudes from your body throughout the day. The IHA Lavender Antiseptic Bathing Bar comes in a cream cardboard packaging and the bar itself neatly wrapped in clear plastic sheet. 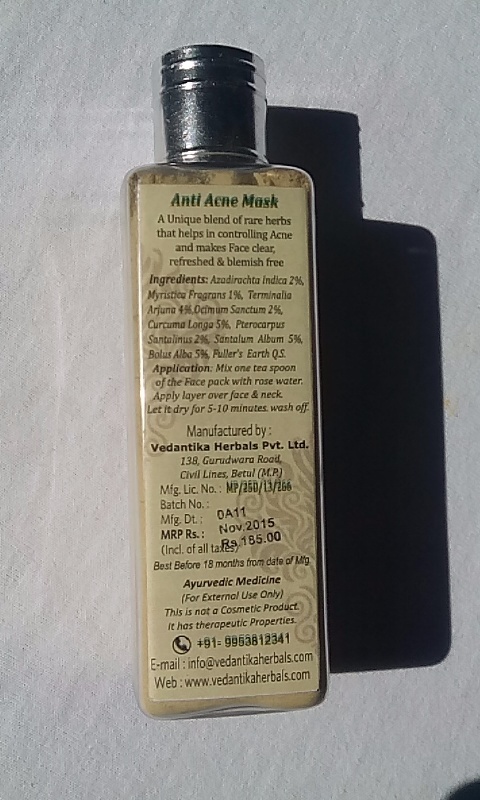 Each gram contains Dadrughana Leaf (Cassia Alata) 50mg, Dharu Oil (Lavendula Augustifolia) 20mg, Grape Seed Extract (Vitis Vinifera) 30mg, Ajawain Oil (Thymys Vulgaris) 10mg, Rusmari Oil (Rosmarinus Officinalis) 30mg, Jhandupushp (Tegetes Patula) 20mg, C.I.142090, fragrance, base q.s. Make your body wet. 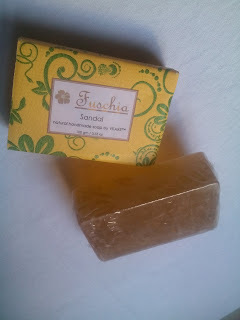 Apply the soap on the body and massage to work up lather. Wait for few minutes and then rinse off. This soap bar is must have for every home. 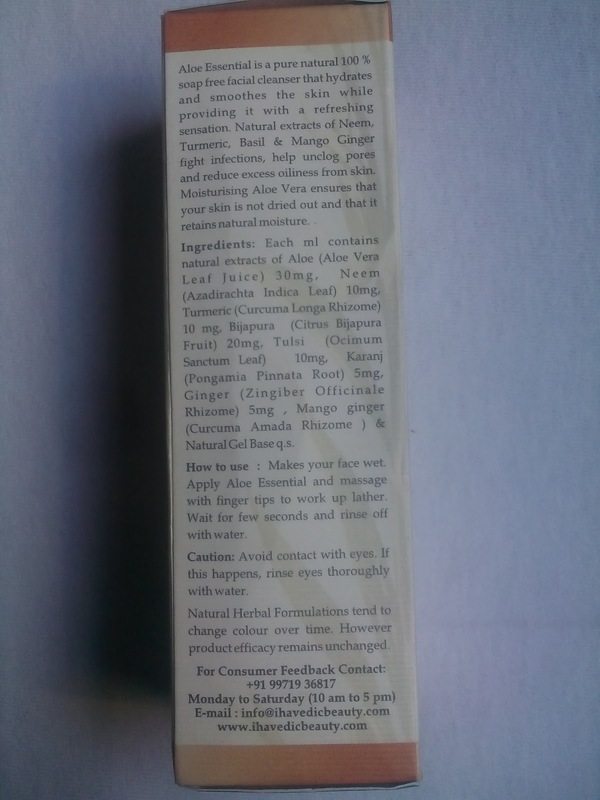 It is great asset in treating a number of skin concerns such as inflammation, eczema, sunburn, itchy skin etc.. The aroma is also quite mild and lingers for a certain period of time. IHA Aloe Essential is a pure natural 100 % soap free facial cleanser that hydrates and moisturises the skin while providing it with a refreshing sensation. 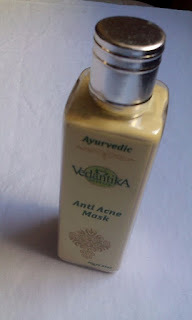 Natural extracts of Neem, Turmeric, Basil & Mango Ginger fight infections, help unclog pores and reduce excess oiliness from skin. Moisturising Aloe Vera ensures that your skin is not dried out and that it retains natural moisture. 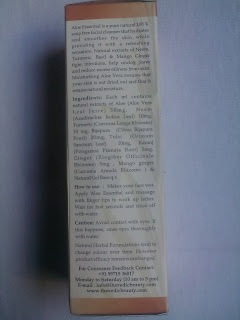 The face wash comes in a plastic bottle which is transparent. A label is stuck on it with all the instructions. The plastic bottle is soft enabling easy dispense of face wash. There is a small outlet on the top which needs to be pressed for the product to be dispensed. The bottle is travel friendly in my opinion as there is less chance of squishing. Overall decent and unique packaging. Each ml contains natural extracts of Aloe (Aloe vera Leaf Juice) 30mg, Neem (Azadirachta Indica Leaf) 10mg, Turmeric (Curcuma Longa Rhizome) 10mg, Bijapura (Citrus Bijapura Fruit) 20mg, Tulsi (Ocimum Sanctum Leaf) 10mg, Karanj (Pongamia Pinnata Root) 5mg, Ginger (Zingiber Officinale Rhizome) 5mg, Mango ginger (Curcuma Amada Rhizome) & Natural Gel Base q.s. Apply Aloe Essential and massage with finger tips to work up lather. Wait for few seconds and rinse off with fresh water. 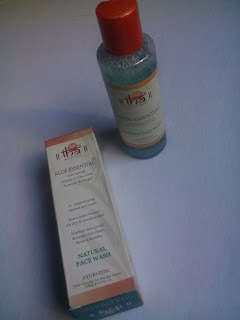 My skin felt hydrated than before and regular use made it less problem free. This face wash is gel based. 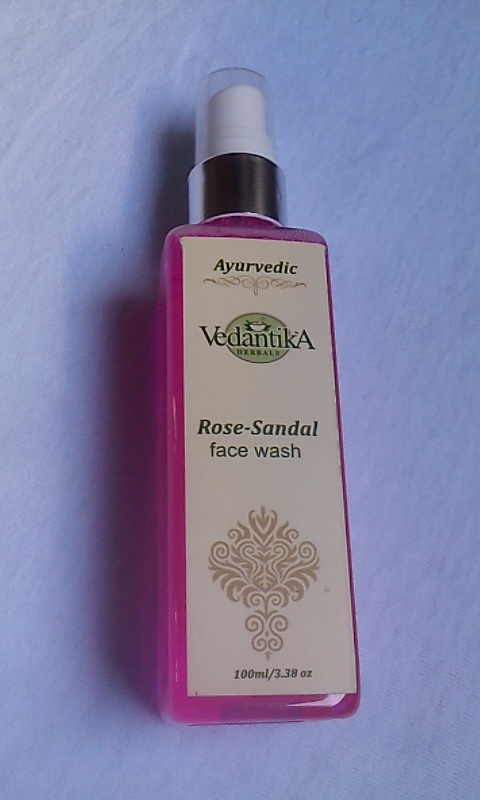 With the goodness of Ayurveda and all natural ingredients this face wash is worth a try. 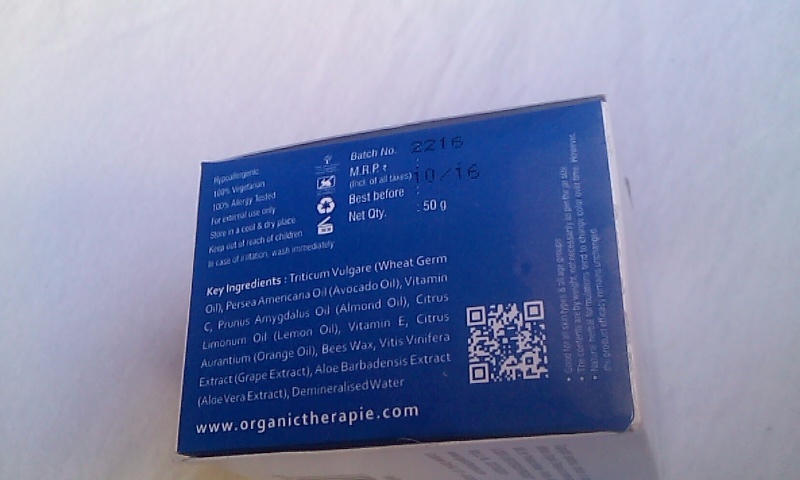 Organic Therapie is a revolutionary line of natural extracts based health & beauty products. It is the latest name in the world of natural ingredients based Beauty products which are free from any harmless chemicals and Parabens. Its award winning products are created with hand - picked ingredients to give you the best that nature has to offer. 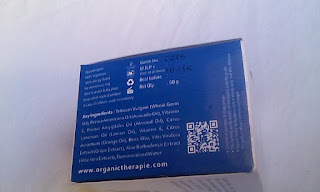 Organic Therapie respects the environment and believes passionately about protecting our ecosystem. They strictly discourage cruelty against animals. 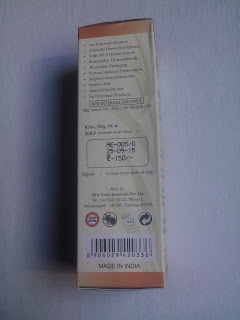 They do not buy raw materials which are tested on animals and all their products are completely vegetarian. 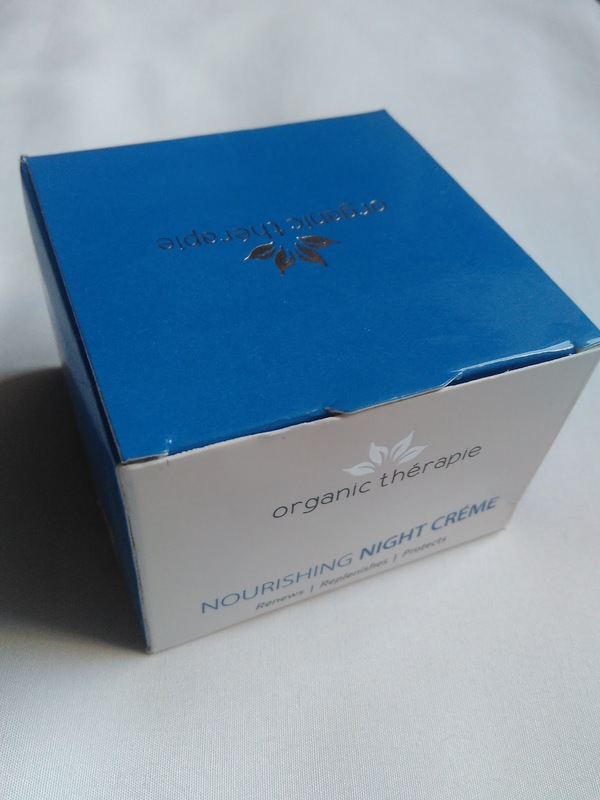 Wake up to a naturally radiant and younger looking skin with regular use of this luxurious night cream. 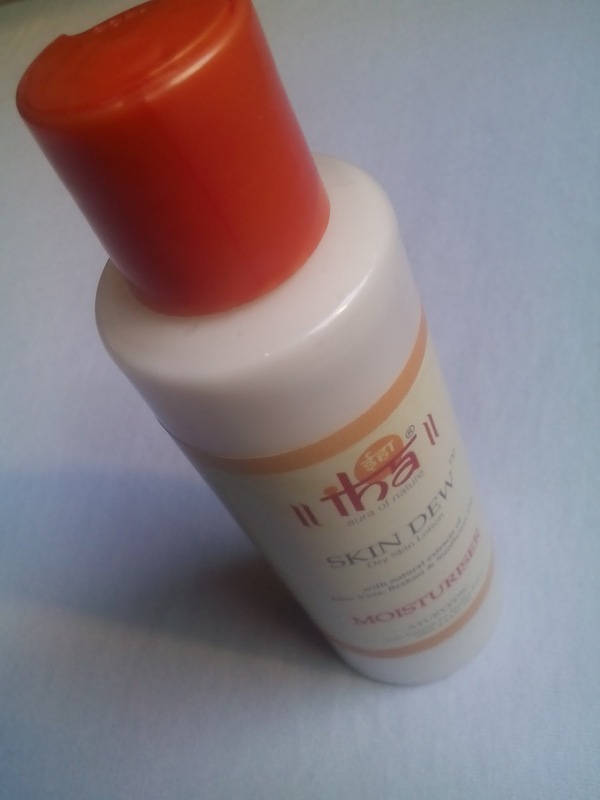 It consistently hydrates and replenishes essential moisture to keep your skin soft, smooth and well nourished. 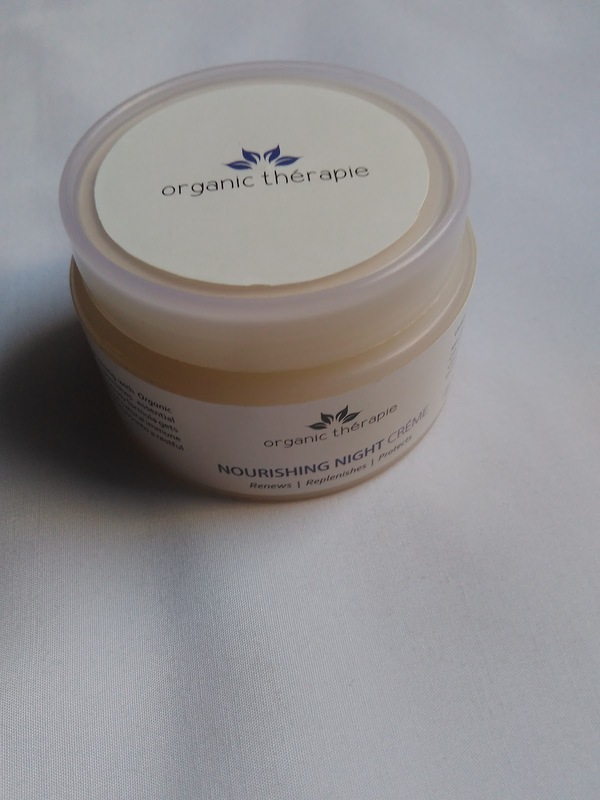 This non greasy formula gets easily absorbed and works all night to replenish lost nutrition and boost the natural immune system of your skin to fight daily stress. 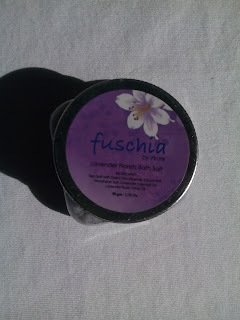 Added aroma oils, calm your senses & gently ease you into a restful sleep. 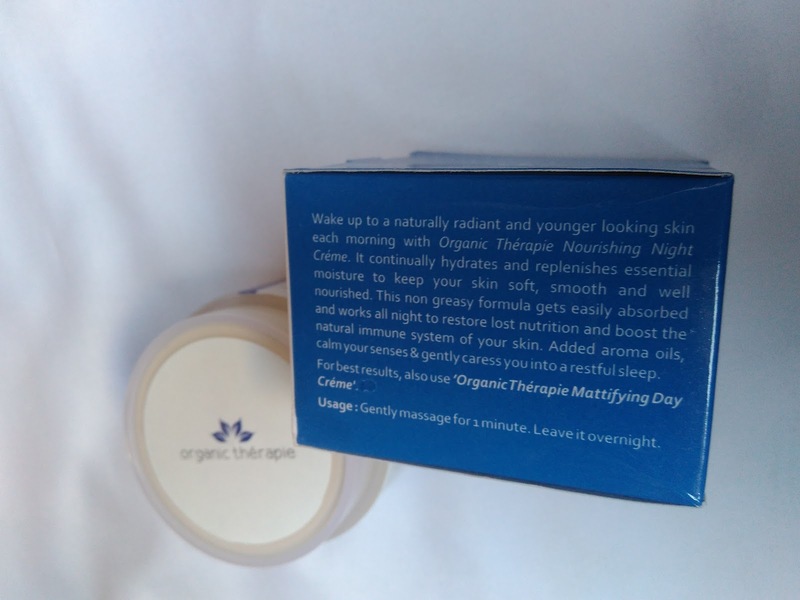 The packaging similar to Organic Therapie Mattifying Day Crème . Triticum, Vulgare (Wheat Germ Oil), Persea Americana Oil(Avocado Oil), Vitamin E,Prunus Armeniaca(Apricot Oil), Prunus Amygdalus Oil (Almond Oil),Bees Wax, Citrus Aurantium (Orange Oil), Aloe Barbadensis Extract (Aloe Vera Extract), Demineralized Water, Vitamin C, Vitis Vinifera Extract (Grape Extract), Limonum Oil. 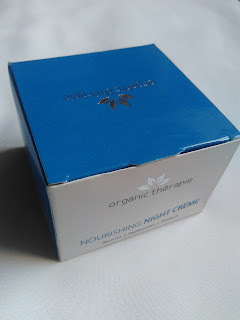 It does not leave my skin sticky and oily that is something i like about the creme the most. 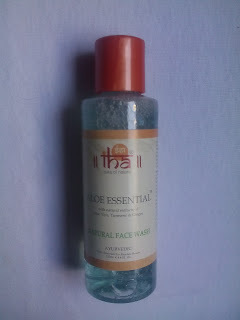 Overall love this product and would definitely repurchase this.